Does anyone really think about water consumption when grocery shopping? We're all by now familiar with the term 'carbon footprint', but what about our water footprint? While most people have their upcoming bill in mind when taking a long shower or watering the lawn, does anyone really think about H20 when grocery shopping? As the infographic above shows, depending on your diet, the food we buy can have a huge water footprint. If you buy 1kg of beef for a barbecue at the weekend, there has been an average of 15,415 liters of water used in its production! 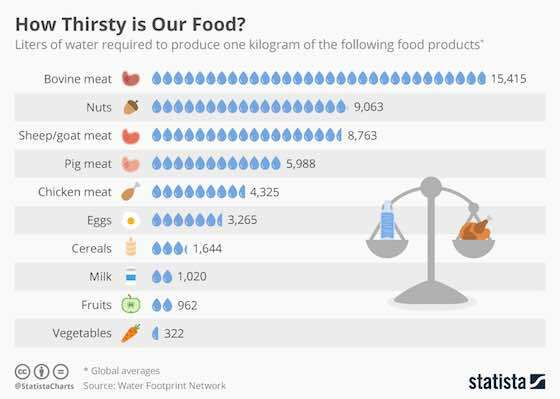 Breaking up meat's monopoly as the most thirsty food type is nuts, with 9,063 liters of water needed to produce the average kilo. Further down the scale are fruits and vegetables, requiring 962 and 322 liters per kilogram respectively. In terms of the most water-efficient way to consume calories, the best option from this list is cereals -one kilocalorie demanding 0.51 liters. The chart above shows the liters of water required to produce one kilogram of certain basic food products. Environment: "How Thirsty is Our Food?"